I had heard legendary stories about the MBL and the Embryology course in the months leading up to it. Stories about the collaborations of minds that wouldn’t normally meet in the same lab, discoveries that could only have occurred at the MBL, it’s what made me apply. But once I was accepted the nervousness kicked in. The other ubiquitous tales are of the incredibly long days and equally long nights in the lab. I’m not a night owl, I’m an eight-hours-a-night sleeper and I was convinced I would be the first and go to bed every night. I worried that I wouldn’t be able to keep up with my classmates-valid, reasonable concerns I initially thought. The atmosphere at the Embryology course is electric. I felt like I was buzzing for six weeks straight and didn’t want to, almost couldn’t, leave the lab. To be surrounded by incredible classmates that get just as excited about the idea of an impossible experiment as me, egged on by brilliant, hilarious and endlessly supportive faculty every night? Why would you go to bed? I remember a night when I absolutely HAD to image primitive streak ingression in the chick embryo with mosaic labelled cells. Andrea Streit and Claudio Stern sat with me and coached me through flipping a paper-thin stage-three chick embryo and poking it delicately with a dye loaded needle before imaging it for 16 hours. I can’t describe how excited I was waking up at 8am to turn off the microscope before lecture. Only to miss breakfast because I was watching my movie over and over again as I watched labelled cells stream into the embryo. It’s also when I realized how amazing my classmates were. That morning, I walked bleary eyed into lecture and was promptly handed a bagel and a steaming cup of coffee. I learned to trust my hands during the Embryology course. I had never dissected anything before and I found that I love it. I dissected anything I could get my hands on throughout the summer, culminating in a few of us dissecting ovaries out of every arthropod species we had on hand. We imaged structures that had only been described in the early parts of the 20th century. It’s also where I learned to be fearless. 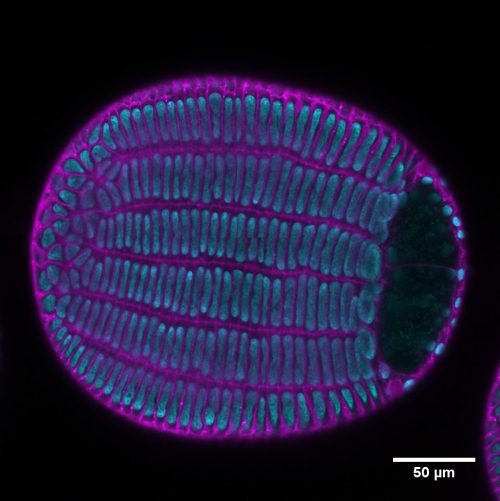 The lack of adverse consequences and the adventurous atmosphere meant that I got sea urchin embryos drunk to see how it affected their skeleton, I transplanted cells into zebrafish embryos and I tried to image tardigrade gastrulation. We used Walmart items and state-of-the-art microscopes in the same experiments! I can confidently say that 75% of everything I tried failed, but that was part of the fun. Our class motto ended up being along of the lines of “in DAPI we trust”. The course tested my intellectual endurance like nothing has before. There is NO pressure to produce or perform, no judgement, no deadlines. You have to find your own drive to learn and try and fail and try and fail and sometimes succeed. Thankfully, its not hard to find that drive. At least six lectures a week from the best minds in the field, who then join you in lab and encourage you to answer impossible unanswered questions. Faculty that are just as willing to give you moral support at the microscope as they are to come have a drink with you at the local pub. Faculty that agree to an hour-long “sweatbox” Q&A session after a two hour talk so we can pepper them with every question under the sun. How can you resist? Every time it got too hard or too overwhelming, there was always someone to get pie with at Pie in the Sky, always someone willing to take a quick dip into the ocean and always someone willing to “hunt for lightning bug embryos” on a walk by the ocean. The science makes the Embryology course amazing and enriching, the people make it incredible and special. Last summer I learned what I wanted to do and be as a scientist but I also made friends for life #embryology2018. 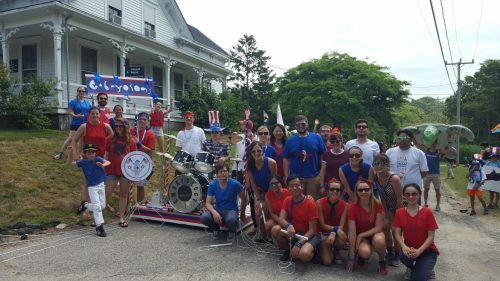 We enacted convergent extension during the Woods Hole 4th of July parade.